As a car owner, you know how important the belt tensioner is for your 2002 Honda Odyssey. 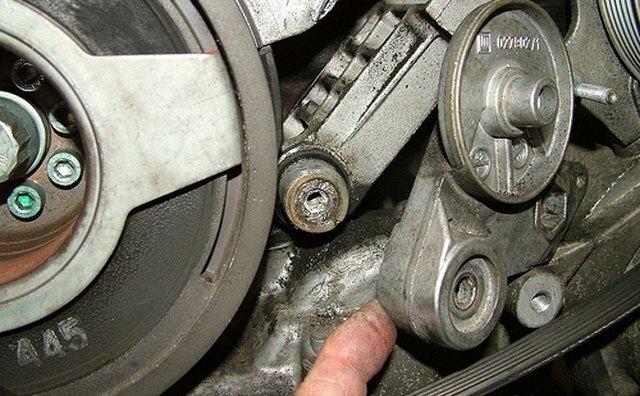 However, internal parts wear and damage will loosen or seize the tensioner wheel, causing the belt to slip and make noise. Eventually, the belt may break, shut down the engine and lead you into a serious traffic accident. Before that happens, replace the tensioner on your Honda model and save yourself a lot of problems. Look for the drive belt routing diagram on your vehicle's engine compartment. This is a black and white label, about 4 by 6 inches, usually attached to the radiator shroud or near the strut towers inside the engine compartment. This diagram will be your guide when reinstalling the drive belt. If cannot find one, make a simple sketch on a piece of paper. Insert a belt-tension release tool, or similar tool, into the auto-tensioner arm. Rotate the auto-tensioner arm counterclockwise and slip the belt off the tensioner pulley. Release the auto-tensioner but do not let it snap back in place. Remove the drive belt from the engine compartment. Unscrew the two auto-tensioner mounting bolts using a ratchet, ratchet extension and socket. Note the location of each bolt because they are of different size. Remove the old auto-tensioner from the engine compartment. Set the new auto-tensioner in place and start the two mounting bolts by hand. Make sure you install the bolts in their original place. Start tightening the bolts until they hit the stop using the ratchet, ratchet extension and socket. Torque the two bolts using a torque wrench. Torque the small bolt to 16-foot pounds [22 Nm] and the large bolt to 47-foot pounds [64 Nm]. Install the drive belt on each of the pulleys except the auto-tensioner pulley, following the routing diagram. Turn the auto-tensioner counterclockwise using the belt release tool. Slip the drive belt over the auto-tensioner pulley. 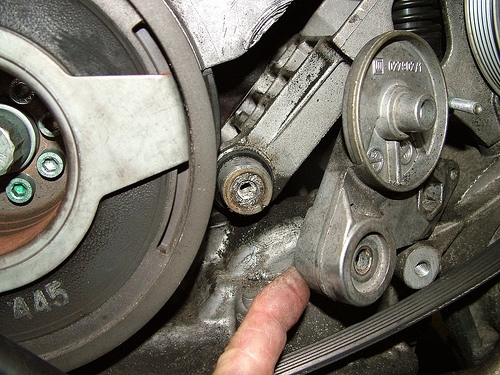 Verify that the drive belt is properly routed and seating correctly on each of the pulleys.